Yesterday, I had the pleasure of watching the GLO Premier League 2011-2012 Round 2 match between last season’s champions, Berekum Chelsea FC, and Liberty Professionals FC. Liberty Professionals FC took the lead through a tap-in from Zuberu Fuseini. Berekum Chelsea FC leveled the score through a penalty from captain Mohammed Abdul Basit. Substitute Yaw Alexander became the hero when he scored after a goalmouth melee during extra-time. It was an interesting game between a very defensive, hard-working away side and a home side who at times seemed to lack ideas. Newly signed goalkeeper Collins Addo (born 24.04.1989) was in post for Chelsea. Addo, who starred for New Edubiase United FC last season, looked solid but was not forced to make any difficult saves. Chelsea will have a luxury problem when last season’s first choice Ernest Sowah (born 31.03.1988) returns from national team duties. I doubt that an established goalkeeper like Addo will be happy with sitting on the bench. Alfred Arthur (born 25.12.1986) played at left-back. Arthur, a strongly built player, was very much involved in the game and Arthur is not a typical left-back. He is often dictating the attacking play of Chelsea and he cover considerable ground up and down the left-flank. I’ve known for several years that Arthur is a quality player who perhaps deserves more recognition and credit. Eric Agyemang (born 01.05.1989) played at right-back. Agyemang was not very visible and seemed to focus on defensive responsibilities. His passes and crosses were not as good as they usually are. The central defence consisted of the experienced Richard Afari (born 03.07.1980) and the youngster Ahmed Adams. I’ve seen Afari a couple of times before but I’ve never seen him better than yesterday. Afari intercepted dangerous crosses, shots and through passes and his work-rate was exceptional. He is very strong and commanding. 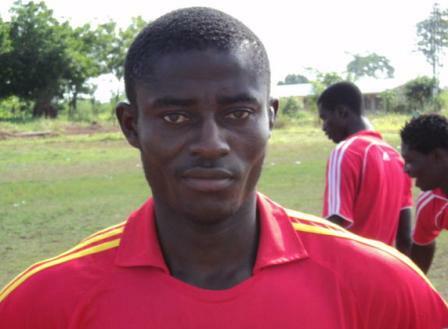 His partner, Adams, is widely considered as one of the most talented central defenders in Ghana. Adams has great heading and jumping ability and played a no-nonsense kind of game. The picture is of Adams and is taken from berekumchelsea.com. As always, the midfield of Chelsea was commanded by captain Mohammed Abdul Basit (born 19.01.1986). His technical ability, passing and intelligence is simply top-shelf and I personally think Basit is the best midfielder in the GLO Premier League. Basit was surrounded by the more defensively oriented Jackson Owusu (born 15.10.1988) and new signing Solomon Asante (born 06.03.1987). Owusu, one of the longest serving players at the club, is great in winning the ball but needs to work with his distribution. Owusu plays with the heart on his sleeve and is a great example for more inexperienced players. Asante, who has played for ASFA Yennenga in Burkina Faso for a couple of years, did not have a very good game. He did not seem to know what he should do with the ball and was described as “the weakest link” of Chelsea by the TV commentators. Asante was eventually substituted with “veteran” Yaw Alexander (born 06.01.1987), which proved to be a smart move. Alexander is a midfield workhorse who seemed more effective than Owusu and Asante. From my point of view, the midfield trio of Basit, Owusu and Alexander are the most important factor behind the recent success of Chelsea. There has been a lot of focus on the new signings of Chelsea before the season but I would personally stick with the three mentioned players, even though Owusu and Alexander are somewhat unfashionable players and even though all players are a bit too old for big money moves to better leagues. Gladson Awako (born 31.12.1990) is a big name signing from Heart of Lions FC and I had expected more from the petit midfielder who is a former star of the Ghana U-20 national football team. Awako played at the right-wing and seemed uncomfortable. Awako is more of a holding midfielder from my point of view. Nurudeen Ali (born 16.05.1991) played at the left-wing. Ali, who starred for Aduana Stars FC last season, was rather anonymous. When in form, Ali is very effective, skillful and hard-running. Ali was substituted for Karim Sadat (born 24.10.1989). When Sadat entered the match, Awako was moved to the left-wing. I did not get any good impression of Sadat. Emmanuel Clottey (born 30.08.1987) played as a centre forward and was very lively, hard-running and won a lot of duels, especially in the air. However, Clottey disappeared in the second half. I think Clottey is a bit disappointed to still be in the GLO Premier League, as his 15 league goals from last season should have been enough to earn him a move back to Europe. Clottey was replaced with young winger Mubarak Moro (born 05.07.1994). Liberty Professionals FC played with their talented youngster James Akwasi Acheampong (born 30.11.1991) between the sticks. Unfortunately, Acheampong became somewhat of a villain, as he fumbled with the ball when Alexander scored the winner. Acheampong seems very confident, at times almost arrogant, but needs to work with his concentration. I had a hard time trying to define the formation of Liberty Professionals FC. Daniel Gyamfi (born 28.09.1984) played at the right-back and I was very much impressed with this rock-built player. Gyamfi is hard-working, disciplined and makes valuable attacking contributions. Gyamfi became injured and was replaced with the talented youngster Yusif Ayoma, one of the most promising teenage right-backs in Ghana. At left-back, I was very surprised to see new signing Baba Gullit (born 23.09.1987). Gullit, who was a playmaker at New Edubiase United FC last season, is definitely not a defender but he did well enough. His left-foot is one of the best in the league. David Addo (born 07.09.1982) and Michael Annan (born 12.10.1985) forms an experienced central defensive duo. They did very well to neutralize Emmanuel Clottey. I’ve always liked Addo and Annan but they are somewhat “old school” central defenders – big and strong and great in the air. Kingsley Nteng seemed to play in a sweeper position at times, shielding the central defenders. At times, it seemed like Liberty played with five defenders and other times, it seemed like they played with three central defenders (Addo, Annan and Nteng) and Gyamfi and Gullit as wing-backs. Michael Helegbe (born 15.09.1985) is the playmaker of the team and he is always spreading the play and dictating the game. His creativity and vision is brilliant. Issah Yakubu played as a box-to-box midfielder and his working rate is impressive. Yakubu is a dynamic all-round midfielder who is best when he is attacking. Isaac Sackey was the revelation of the game from my point of view. Tall, elegant Sackey was part of the Liberty U-17 team in 2010 and is obviously a very young player. He played as a holding midfielder and made some crunching tackles. Sackey deserves credit as he managed to prevent Basit, Asante, Awako and Jackson to roam free. I will definitely follow Isaac Sackey closely during the season. Sackey was replaced with Nana Tuffour Frimpong (born 13.11.1991) played a few minutes for Sackey. Tuffour Frimpong was signed from Deportivo FC before the season. Zuberu Fuseini has now scored two goals in two matches for his new club. Fuseini, a fringe player at AshantiGold SC last season, almost seemed to play in a free role and was seen both on the left-wing and the right-wing. Fuseini is very mobile but to be honest, I felt that Ahmed and Afari had him under control, despite his tap-in goal. Fodé Moussa Sylla, the striker from Guinea, played as a lone striker. Sylla is a big and strong player who had a very difficult game and failed to make any impression. Sylla was replaced with mystery man Ellesah Mensah, formerly of AshantiGold SC. Centre forward Mensah was not very involved but his physique was commanding.